With its Koch brothers funding and climate denier affiliations, the Berkeley Earth Project finally laid 'Climategate' to rest last week, affirming the climate data of NASA and others. So now we return to the more complex questions of what to do -- with denial coming from a very different direction. Shining the light of truth onto this denial is a single graph in a major new United Nations Assessment about to be released, showing that even aggressive reductions of CO2 emissions have no effect on warming until about 2040. This is largely because many primary CO2 emission sources co-emit aerosols with CO2. Aerosols on balance cool the planet, but being very short-lived we lose this cooling much more quickly than CO2's warming declines. In stark contrast, the same graph shows that methane and black carbon reductions can achieve considerable impacts on warming very soon. "Comprehensive" plans like Waxman-Markey could bring mild near-term climate benefits, but 100% of that comes at first from non-CO2 reductions or increasing carbon sinks through risky credits. With recent drought, flood and fire bringing a foretaste of the costs of climate disruption, shall we continue aiming for such a "comprehensive" plan? Politically, the approach has already been in deep trouble. What has not been clear, however, is why it is unwise for the climate and what should be done instead. Our biggest challenge will be drastic cuts in CO2, perhaps down to near zero by mid-century, as we'll need a planet after 2040. 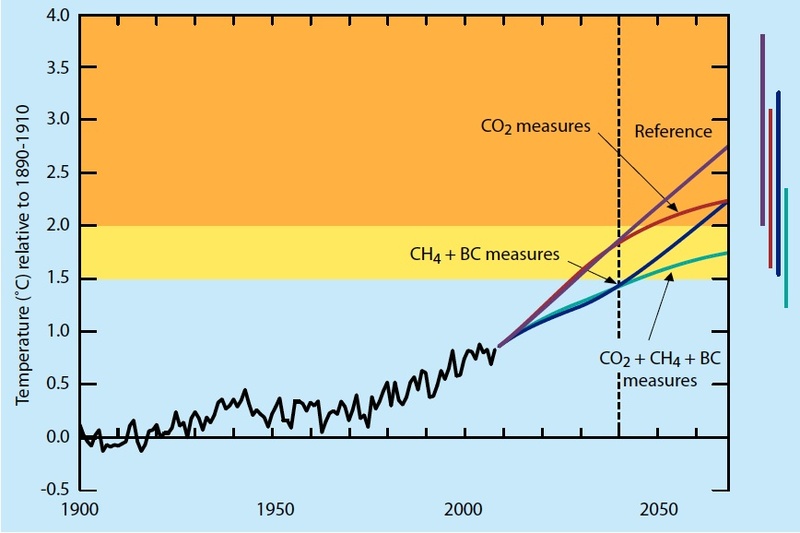 But central to this UN graph is that those CO2 cuts must be decoupled from methane cuts, and the methane cuts must be strongly 'front-loaded' to help preserve near-term climate. The multi-gas strategies value the non-CO2 gases against CO2 using an inappropriate 100-year time frame which undervalues methane by up to 400%, impeding rapid methane drawdown. It makes much more sense to combine methane with black carbon in a separate package for near-term protection. Indeed, we have no choice about this: this is the only emissions policy that can effectively impact the climate changes we are experiencing right now. To claim otherwise is its own form of denial. In an appeal to developing nations, the United Nations report focuses on measures beneficial to both climate and health, and thus black carbon, causing an appalling number of deaths, is emphasized first. But methane's climate effects are far more certain than are black carbon's, and so while we should do both, we must focus more on methane at first, aiming black carbon cuts mostly towards sources that save lives (cookstoves), while scrutinizing their effectiveness and increasing them greatly if very helpful for the climate. Skeptics will likely still claim for a while that global warming is not caused by us. They are wrong, but might soon be right: that is, if we let the arctic continue melting, and the methane stored in the Eastern Siberian shelf come out, the problem won't have much to do with us any longer, as even just a few percent of it would swamp all attempts to control warming, shifting the planet rapidly to a new state. So, while CO2 is surely the largest chunk of human-induced warming, the "fierce urgency of now" in climate is methane. We either reduce our methane emissions sharply now, giving ourselves a fighting chance to deal with the CO2 problem over the coming decades, or we seriously risk letting 'non-human' methane push Earth to a hotter state. Perhaps we can finally close the debate with deniers through methane: no one can contest how much methane is stored in the Siberian shelf, no one can contest what it will do if released. And no one should contest any longer that its state is changing: just recently the NCAR HIPPO project concluded three years of the highest-tech greenhouse gas readings yet. Its first big surprise: background levels of methane are rising over large areas of the arctic ocean. Robert Watson, the former IPCC chairman, admirably started the Global Methane Fund (GMF) in 2009 saying we need near-term cooling and methane is the best way to start. The GMF later joined the U.S. EPA's Methane to Markets to form the Global Methane Initiative, which estimates it could cut by 2020 50% of those methane emissions costing less than $40/ton, if it can greatly leverage an initial $200-300 million. But that is less than half of what should be achievable in even less time. 'Methane Apollo' is my name for what might help us -- an Apollo-like half-decade project centered on massive methane reductions from gas and oil, coal mining, landfills, agricultural waste, and wastewater. Scientists call something that perturbs our planet's energy balance a 'radiative forcing', adding warming if positive, cooling if negative. With rapid reduction of methane emissions by a third, methane should restabilize around 1250 parts per billion over fourteen years, reducing radiative forcing by almost a third of its increase since industrialization. If some recent studies of black carbon are correct, then the methane and 20% black carbon cuts together could temporarily cut by almost half (~45%) all the radiative forcing added since industrialization. These measures should be particularly effective in the arctic, moreover, because of the roles there of ozone and black carbon. Unlike the "350" movement for CO2, the "1250" goal for methane with added black carbon cuts makes for a practical immediate goal. The total 'cost' would be around $250 billion, but is effectively far less. Some of the methane provides a profit stream from captured emissions producing energy, attracting investment. Methane to Markets leveraged their modest $50 million expenditures by almost eight times. If G20 nations put up amounts between just $1-5 billion, averaging about $3 billion each, then this $60 billion would only need to be leveraged about four times. Let's do it, fast, and let's hope it is not already too late.